Subject: Is there a dire enemy of the Desert? Putting together a PnP set as I missed the kickstarter. Is there a Dire desert enemy? It's the only one I can't see any where. The desert costs 2 action points to move out of. Therefore, the desert itself is a dire enemy. In the basic PnP, the manticore (lion scorpion) is the desert Dire Foe. 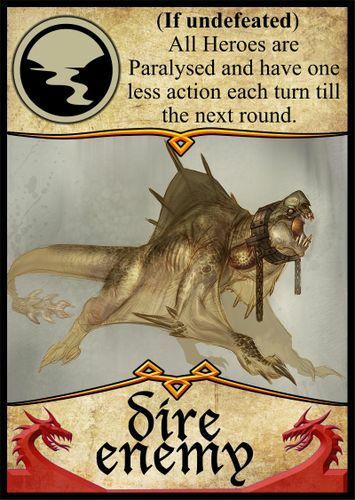 In the premium PnP, there is a dire foe for every region, and two for the Forest, for a total of 8. The Epic Foe for the desert in the premium PnP is the Colossus. I am such a dimwad. I meant plains! Does the collosus replace the scorpion/manticore? The Colossus is Epic, the Manticore is Dire. For the plains, the basic PnP has an Epic Foe (Giant) but no dire foe. The Premium PnP coming out next month will have a dire foe (Giant Wasp Swarm). Its power is "Any hero at full health must lose one health." If you were sleeping, forgot, just found us, etc. it is not too late. For a limited time, I will be taking late pledges for Tiny Epic Defenders. Yes, you can pledge for the Deluxe Edition during this window of time. If this is you, and you are interested, these late pledges are processed via paypal. The same price structure as KS will be honored during this time. Paypal your pledge to michael@gamelyngames.com and make sure to include in the comments, your address and exactly what you are pledging for. In the retail edition you'll get exactly 1 dire enemy and 1 epic foe for each of the 6 regions, so you really can't guess where those are appearing. In the deluxe edition (which I believe you could still preorder if you do it now and ask Gamelyn Games directly) you have 2 more dire enemies and 2 more epic foes (and more heroes and artifacts as well), each of those 4 attacking a different region. each of those 4 attacking a different region. a) Does anyone know yet where the basilisk will attack? It will have to be anywhere but the forest, since that region already has two confirmed dire foes. b) In the prototype, the Fire Elemental attacks the Plains. On the Kickstarter page, it has the Desert symbol. I'm guessing it's been changed for the production version? Thanks! I'm not sure I like that since heroes are usually camping in the plains anyhow, so it's better to put more foes in other regions, but I won't complain until I've seen and played with it. From the flavor text, we know it paralyzes. Maybe it always costs 2 actions to move, or maybe you can't take move actions on your card for the rest of the round? What did you do for it's power? Yeah, I thought about that option too. It would be really brutal! Even though you can't defend against this power, you can still use fight actions to reduce the threat (assuming the plains haven't fallen), so spreading out your heroes is a must. It seems like the most obvious case for the staff of control that I've ever seen. Move it to the plains and then split heroes' actions between fighting the elemental and fighting the threat. I didn't have any information, so I just have it blank in my template and was waiting for some hints. I think this brutality is just another reason why it only has 6 Health. Park the Sorcerer in the Plains (or a different Hero in the Forest or Ruins) to help keep the Plains threat down while others take on the Fire Elemental. I think the fire elemental was probably moved from the plains to the desert for another reason, too. The developers needed to keep the threat to the regions spread out. If the basilisk is in the plains, that would have made plains the only region with 2 dire foes and 2 epic foes in the same region. Maybe it should read "are paralysed (each hero has one less action per turn till the next round)". This would match your predictions for regions at the very least. As far as I know the Ancient and the Kraken has 10, at least it was in the Sneak Peek in update #19 of the project in the KS. from early pictures, I think both Colossus and the Overlord had 10, but the again, it could have change. but basically almost all the epic foes are around 10, except the giant with 8 and the demon with 6. Sweet Basilisk! I actually really like your power, too. I'm afraid it might be too strong, though. I might say: "Heroes cannot spend HP for additional actions for the rest of the round." Still test it out and let me know how it goes. Also, some of us have collected everything we can find from prototypes and sneak peaks in this thread, so I hope that helps you complete your own set. Yep, saw that thread, great help. Now designing cards back and artefacts and I can start gluing. Characters done now.